UNITED NATIONS (AP) — Calling for more trust, North Korea’s foreign minister urged the United States on Saturday to keep moving past what he called seven decades of entrenched hostility if Washington wants to restart stalled negotiations meant to rid Pyongyang of its nuclear bombs. 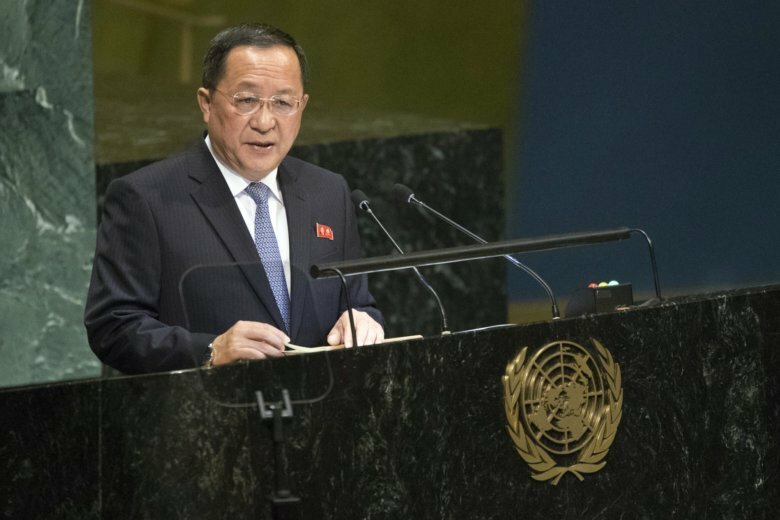 Boiling the rivals’ diplomatic standoff down to the North’s deepening feeling of mistrust, Ri Yong Ho sought to lay out a vision of peace on the troubled Korean Peninsula — provided the North gets what it wants from the United States. Ri, standing at a podium at the United Nations General Assembly in New York, said North Korea is ready to implement the points that his leader, Kim Jong Un, and U.S. President Donald Trump agreed to in June during a summit in Singapore. But his comments were infused with what came across as impatience at the slow pace of progress in a process the world hopes will cause Pyongyang to abandon an arsenal of nuclear-tipped missiles that aims to accurately target the entire U.S. mainland. In recent weeks, Kim Jong Un has said he would permanently dismantle North Korea’s main nuclear complex, but only if the United States takes unspecified corresponding measures. Kim has also promised to accept international inspectors to monitor the closing of a key missile test site and launch pad. The North, however, doesn’t “see any corresponding response” from Washington. On the contrary, Ri said, the United States is increasing pressure and sanctions. “The perception that sanctions can bring us on our knees is a pipe dream of the people who are ignorant of us,” Ri said, adding that the continued sanctions are “deepening our mistrust” and deadlocking the current diplomacy. There was no immediate response from Washington. Secretary of State Mike Pompeo said last week he would return to Pyongyang to set up a sequel to the Singapore meeting between Kim and Trump. Despite the muscular tone, Ri’s high-profile speech was downright mild and balanced compared to the florid vows of nuclear strikes and claims of U.S. perfidiousness that have been typical fare from the country’s propaganda services. This was decidedly so during an exchange of threats between Washington and Pyongyang that accompanied a run of increasingly powerful weapons tests last year that put the North on the brink of its claim to be a full-fledged nuclear power, and had some fearing war. The tenor of Ri’s comments was clearly meant to push a wary United States to agree to a declaration formally ending the Korean War, which ended with a ceasefire, not a peace treaty. Washington is wary of endorsing such a declaration, which could lead to a formal peace treaty. Pyongyang demands the removal of the 28,500 U.S. troops stationed in the South to deter North Korean military adventurism. The United States wants the North first to provide a full account of the components of its nuclear program. After their summit in Singapore, Trump and Kim issued a vague statement about a nuclear-free peninsula without describing when and how it would occur. Post-summit nuclear negotiations between Washington and Pyongyang were rocky and quickly settled into a stalemate. There is widespread skepticism that Pyongyang is serious about renouncing an arsenal that it likely sees as the only way to guarantee its safety. Part of that skepticism is based on a bitter history of nuclear negotiations breaking down in mutual recrimination. But there’s also stronger evidence for this wariness: Recent satellite photos have indicated Kim’s weapons factories were still operating to produce fissile materials to make nuclear weapons. The doubt is always present on a peninsula so used to threat and bloodshed. What’s different now is that it seems to be suffused with a tentative but unmistakable hope. Follow Foster Klug, Associated Press bureau chief for South Korea, at @apklug.